Hayfever affects a whopping 25% of us. It’s uncomfortable and can cause itchy, red, puffy and watery eyes. For some, it’s a real misery. The culprit is pollen. Pollen enters the body through our mouth, nose and eyes. In people who suffer from hayfever, their bodies immune system identifies this pollen as a harmful invader. Immune system cells, called mast cells, bind to the pollen and trigger an allergic response. This allergic response causes a substance called histamine to be released near the pollen particles. Histamine is designed to combat the harmful invader, pollen. It is this histamine that gives us our hayfever symptoms. It causes our runny nose and sneezing. It can also cause our eyes to be extremely itchy, red and puffy with a watery or stringy discharge. When hayfever affects our eyes, it’s called seasonal allergic conjunctivitis, or vernal conjunctivitis. Don’t worry – this type of conjunctivitis is not contagious and can’t be passed from person to person. People can be sensitive to different types of pollen, such as grass pollen, or specific types of tree pollen, or a mixture. 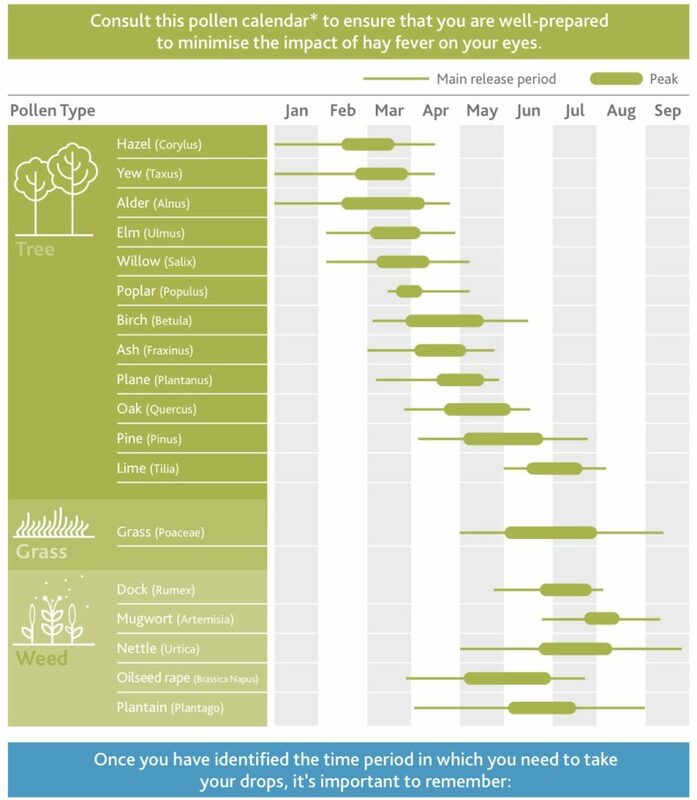 You can use the guide below to help identify what types of pollens cause your hayfever by the time of year that your hayfever flares up. For many, the hayfever season begins now and we see this with our patients presenting with red, watery, itchy and puffy eyes. So, what can you do to prevent hayfever affecting your eyes? It is really useful if you can identify the types of pollen that you are allergic to. Avoiding these pollens is the most effective way of preventing allergic conjunctivitis. Also check the pollen count forecast each day. Wearing close fitting glasses or sunglasses will help stop pollen particles getting in your eyes. You can see your pharmacist for eye drops. 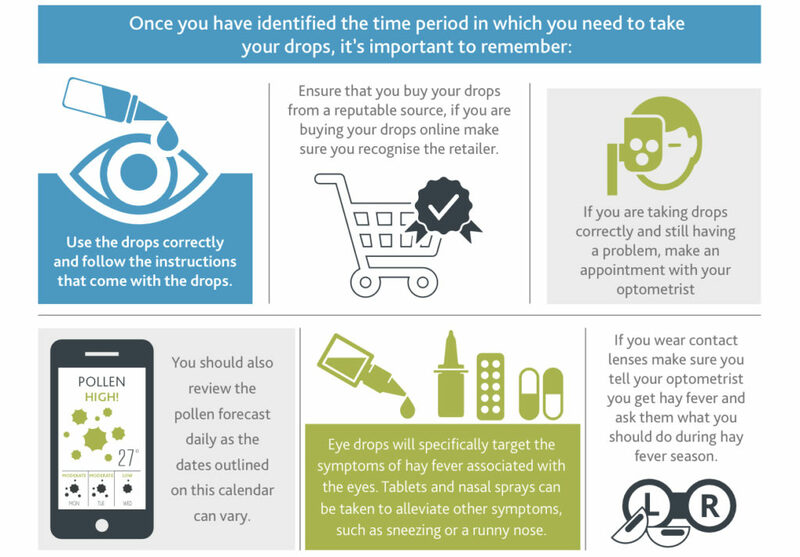 Sodium cromoglycate eye drops are best taken before, and continued through the hayfever season. They help prevent the mast cells in our eyes from binding to the pollen, which stops the histamine. A course of anti histamine eye drops, such as Otrivine, are best if your hayfever has really set in. Don’t touch or rub your eyes. As tempting as it is, this encourages more histamine, which equals more itching, more redness and more discharge. Apply a cold compress. Use a gel eye mask suitable for the fridge. Cool as instructed and place over shut eyes for instant, and wonderful relief. If you can’t get a gel eye mask (from your Optician or pharmacy), use a wet, cold, clean flannel (this won’t be quite as effective as the eye mask, but will still stop that itching). Stop contact lens wear until symptoms have ceased. Contact lenses can sometimes make your hayfever worse. They can trap in pollen, keeping it close to your eyes. Contact lenses also cause gentle, unnoticeable rubbing each time we blink, which, for some people, causes more histamine. See your Optometrist or Contact Lens Optician as swapping to a different contact lens material and wearing daily disposable contact lenses can help. Taking oral antihistamines can help your symptoms along with other hayfever symptoms, like congestion and sneezing. Oral antihistamines can make our eyes feel dry, so you may also want to use dry eye drops whilst taking these. Speak to your Optometrist or Pharmacist for more advice.